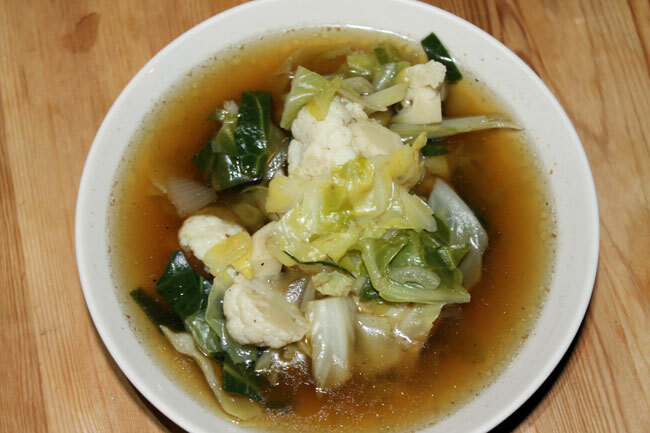 Kale, cabbage, broccoli, cauliflower and other alkaline vegetables can be used in this soup. Greens are especially good for making the body more alkaline. Stock-free, this soup uses simple ingredients to create a quick and tasty base. Ready with 15 minutes of boiling and endlessly variable, this alkaline soup recipe could become the cornerstone of your healthy, low-cost diet. Stock cubes are replaced with healthy oils and pink Himalayan salt, with added flavour from bay leaves, ginger, onion, soya sauce and pepper. Soya sauce can be substituted with Bragg's amino acids if you wish to avoid soy, gluten and/or bad-quality salt in soya sauce. Thoroughly wash all vegetables, chop green cabbage, cauliflower, onions and ginger. Add all ingredients into a 5-litre pot. Boil the water in a tea kettle before adding. Cook for 15 minutes or when the vegetables have reached a desired level of softness. Remove bay leaves and puree the soup, if desired, for more flavour. Add bay leaves back. Before serving, drizzle with olive oil and add salt or soya sauce to taste. Note that the oil is an important flavour ingredient (stock cubes always have plenty of fat in them as well). When using coconut oil make sure that it is very mild flavour - many raw coconut oils are very strong flavour and I personally don't like them, because they overpower other flavours. There are exceptions, however, but the easiest way is to buy non-raw coconut oil which usually has lost its flavour in processing. This soup is especially good for those who have a cold body constitution according to Chinese or Indian traditional medicine systems. It warms the body and would also be suitable to those who eat a high-raw food diet but feel that they need some warmth in their bodies. Most soups and even otherwise healthy foods you buy in restaurants, cafes and stores usually use bad-quality salt in their recipes. Unfortunately most of these foods will also have sugar added. This alkaline green soup avoids those problem, as it uses a healthy, natural salt, i.e. sea salt or rock salt. Read more about the health benefits of good-quality salt here: Benefits of Salt. Always use coarse salt in a grinder because the ready-ground salt usually has added anti-caking agents, e.g. aluminium. This soup provides plenty of fibre, which is very important for gut health. For people who wish to increase the amount of fibre they eat, raw foods can in the beginning pose a problem if their digestive systems are not used to handling so much fibre. For some people it may be better to eat cooked fibrous foods first, because the fibre is broken down and softened when cooking. And about the dangers of sugar here: Sugar Addiction. Note that celery could easily be added to this recipe but I have left it out because it is a common allergy-causing food. Indeed, I found myself that have a food intolerance to celery. You can use the pulse test to test for food intolerances at home for free. Note that according to one theory salt becomes acidic when cooked. So you could choose to add the salt into the soup only after cooking. Green cabbage can be replaced by the same amount (though not the same weight) of green kale. Broccoli is a good substitute for cauliflower. This soup can be divided into two pots and cooked separately: One half of soup blended into a puree and the other half for adding texture. E.g. kale, cabbage, broccoli blended into soup base; and mushrooms cooked separately and added after blending. Both halves of soup should be cooked with onions, ginger, and all the other flavour ingredients, so that the flavours develop and mix properly. Soya sauce can be replaced with Bragg's amino acids (available in health food stores) for gluten-free option. Coconut oil can be left out and more olive oil added in the end, just before serving. The alkaline soup idea came to me after realizing that warm foods and alkaline foods made me feel the strongest. I was diagnosed 'yin deficient' by a Chinese Doctor, which meant that I had to have all my food and drink warm. This piece of advice turned out to be true and very beneficial for my health (after many attempts at raw foods).